Houston has a massive man-made flooding problem that threatens the long-term economic viability of our region. Man-made flooding is caused by our poor local practices and policies related to building and development. Difficult choices must be made by our leadership and our citizens in order to end our on-going flooding threat. Two concerned organizations, Residents Against Flooding and Citizen Solutions to Houston Flooding, asked themselves the question, “What would it take to end Houston’s man-made flooding?” This petition and the supporting material are the results of that inquiry. We hope that by signing our petition your public support can convince our elected officials – from all over the region – that this is an issue of vital importance that demands their utmost attention to do what needs to be done to protect Houston-area homes and businesses. The City of Houston publicizes the idea that 25% of flooding occurs outside of mapped floodplains, while FEMA reports that 65% of flooding in Harris County occurs outside of any mapped floodplain. Entire watersheds must be addressed, not just the floodplains. Recognition that there’s a problem is the first step towards solutions. If Houstonians rise up together and become one voice for change, then we can prevent these dire circumstances from worsening. This is a link to the actual Petition. Please help us help you by adding your signature calling for change. What follows are supporting documentation and suggestions for what needs to be done. Applicability: Regulation, policies, and practices must apply universally to the entire H-GAC area, and to all watersheds, not just floodplains. Detention deficits must be addressed – that which is needed today but was not installed in the past – with a plan on where and how to install detention that meets today’s needs. Designation: Until the H-GAC Multi-County Flood Control District can be assembled, there must be no new adverse impacts from construction. Any elevated properties or concrete on the ground must be mitigated with an equal amount of detention. This effectively freezes flooding close to current levels. Approvals: Any new stormwater discharges or projects that will alter run-off into a given watershed must be reviewed and approved by the Multi-County Flood Control District for that watershed. Regulation: In addition to ultimate responsibility for harmonizing regional ordinances, the District must regulate impacts of impervious cover and fill on storm water drainage and bayou capacities. Enforcement: Existing and new regulation must be enforced with no variances or grandfathering. Incentives: Financial incentives must be available to encourage landowners to retrofit properties to these guidelines, including conversion to pier-and-beam construction. Penalties must be applied for failure to comply. 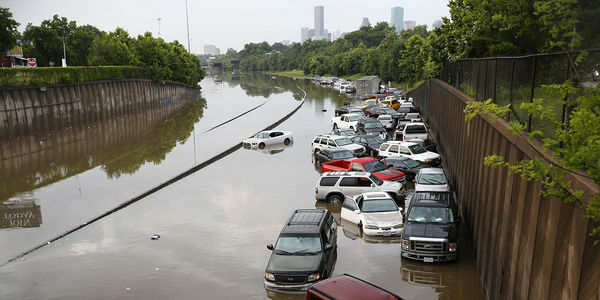 Documentation: Chapter 9 of Houston’s Infrastructure Design Manual (IDM) must be rewritten to reflect the technical requirements addressed herein and otherwise address flooding. Specific sections of the IDM must be removed and made part of the Houston Code of Ordinances so that they are subject to public comment and City Council oversight. Records: To promote transparency and cooperation, the H-GAC Multi-County Flood Control District must keep records in electronic format that the public can easily access and search. Research: Policy decisions must be based on the most advanced modeling available, including accurate elevation mapping and two-dimensional flow analysis. Maps and models must be updated ongoingly. This is a partial list of technical issues that should be addressed. Fill: Only existing dirt on-site should be used for building elevation. Detention: Total detention must be sufficient to prevent structural flooding in a 100-year event. Any detention mitigation banking must occur within the same square mile as development. Planting: Native riparian, water-absorbing grasses and trees must be planted in detention areas. Detention: Including regional detention, it is recommended that there must be a total of 640 acre-feet of detention within each square mile of the H-GAC area (100% mitigation); currently, various county agencies require from 320 to 640 acre-feet of detention within each square mile. Runoff Coefficient: Within all urban areas street drainage must assume urban runoff coefficients of 0.9 or greater. Drainage: Appropriate Manning numbers must be used in calculations to ensure safe flow rates and adequate capacity. Establish rules limiting rates of flow off roofs of multistory buildings prior to entry into local drainage systems. Modeling: Before any drainage project is initiated, accurate and up-to-date elevations and two-dimensional flow modeling should be used to understand storm water flow better so that flooding is not simply moved elsewhere. Develop an area-wide actively maintained modeling system so that accurate analysis can be done on every project prior to shovels in the ground. Begin actively anticipating future development patterns and detention needs, particularly in the upper reaches of watersheds. The federal government has paid more money to Texas for flood repairs than to any other state except Louisiana. It is well past time that we made the hard choices we need to make in order to stop this scourge on our population. Please sign this petition to demand that the local, state, and federal agencies working in the Houston-Galveston area do their jobs and avoid more deadly, preventable flooding. Doing so will increase security and accelerate economic growth in the region.